Every horse farm has to think about water. Water to hydrate your horses, water to wash your horses, is your water going to freeze, will your well run dry, do you have droughts and limited water. In addition to your long list of potential problems with water, you will also need to focus on keeping dust down in your arena and having the proper amount of moisture in your footing if you are not using a coated dust free footing that uses a binder. 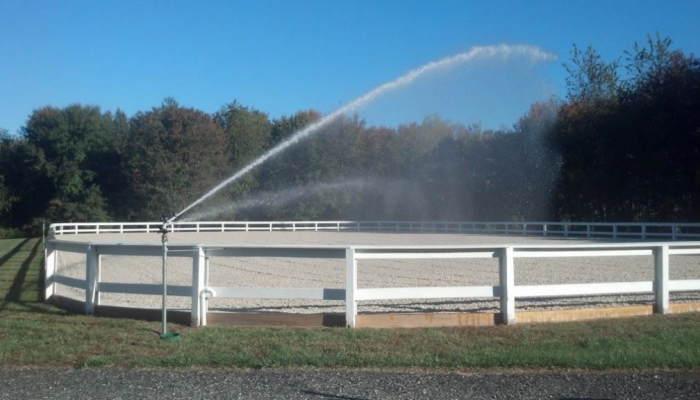 Sprinkler systems are the most popular way to water larger arenas, and there are a few different types. Water reels allow you to unspool a long hose, which can be hundreds of feet long, placing the sprinkler stands where needed. This system allows you to water your entire arena from a single hose. A second type of sprinkler system that is series of permanently installed heads around the exterior of your arena, eliminating the need to reel out hose. This also has the advantage of being able to water all parts of the arena at one time, shortening the overall watering period. These sprinklers can also be set on a schedule; much like a lawn sprinkler system does in a yard. The last option, for indoor arenas, is to have overhead sprinklers installed. Overhead sprinklers are expensive, but provide the most even watering and thus most consistent riding surface. Moisture content of your footing is one of the key factors that contribute to the consistency of the ride; it’s not just to control dust. Let’s say you do use some sort of sprinkler system or you walk around your arena and water it yourself. Once the water soaks into your surface, you’re going to start fighting the battle of evaporation, which will eventually dry out. Plan on watering your arena either in the morning or later at night, definitely do not water it during the midday heat. Think of it like you’re watering your lawn, you don’t do it during the middle of the day. If you watered during the middle of the day, the sun will start to evaporate it before it gets the chance to saturate the sand. Waiting until the correct time of day will help save you time and water. There needs to be 20-25% water content in your footing for optimal performance. This will keep your footing at the correct consistency in order to get the best workout out of your horse and keep the dust down. Those of you that have sand footing, really should invest in a moisture meter, which can range from $50 to $650. You would use this daily on your sand footing after you water it to confirm that you have the correct moisture, and it should be checked throughout the day. Waxed coated footings are dust free footings and do not require watering. This wax actually eliminates the need to keep moisture at an exact number because the wax component of the footing is what holds everything in place, therefore allowing you to train longer and harder without pulling out a moisture meter or stopping your ride to water the arena.